Americans of a certain age will remember a television commercial with a little boy singing about his baloney sandwich. He pronounced it that way, but he spelled it b-o-l-o-g-n-a. Bologna (bo LOAN ya), capital of Italy’s Emiglia-Romano region, holds many nicknames: La Dotta (the learned) because it’s home of the western world’s oldest university, founded in 1088; La Rossa (the red) because of both the color of its buildings and the left-leaning politics of its people; and La Grassa (the fat) because of the richness of its food. Bologna (or baloney), the American cold cut, can trace its origins to the city of Bologna in the form of a sausage called mortadella. Pig farmers have been producing mortadella for at least 500 years, but evidence suggests that the ancient Romans may have pioneered the process. Originally, the sausage was made by grinding meat with a mortar and pestle, and some etymologists think the word mortadella may derive from the Latin word for mortar (moratlis). 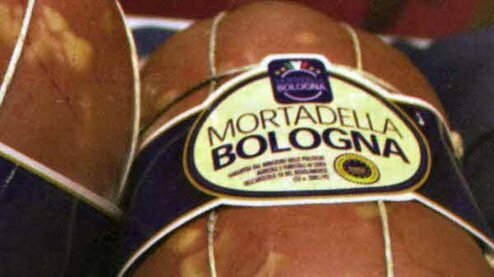 And while mortadella is made in several regions in Italy, the Mordatella of Bologna is protected by European law and bears a label attesting to its authenticity. True Mortadella di Bologna must be made entirely of pork (Some forms of mortatella may contain beef, mutton, or horse). After the pork is ground, it is seasoned with a blend of salt, white pepper, peppercorns, coriander, anise, and wine. Cubes of pork fat, cut from the throat, and sometimes whole pistachios, are added as well. The mixtures is stuffed into a natural casing and baked, not smoked. After coming from the ovens, mortadella is air dried to firm it up. 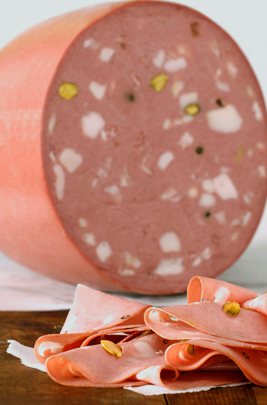 In Italy, mortadella, like other cold cuts, is sliced paper-thin. It is often served as an appetizer or on sandwiches, but it can also be used in many other dishes as well. Put the oil and onion in a frying pan and cook until the onion is soft. Do not let it brown. Add the mortadella and cook for about a minute, stirring from time to time. Add a pinch of salt and a grinding of black pepper. In the meantime, bring a pot of water to the boil and cook the pasta to the chewy stage (al dente). Drain. Just before serving, stir the parsley into the sauce. Immediately pour the sauce over the cooked pasta and serve.